The EGS5110P is a Smart PoE+ Switch that offers 8 Gigabit ports with IEEE802.3at/af PoE Support on all its ports and 2 SFP slots for fiber uplinks. 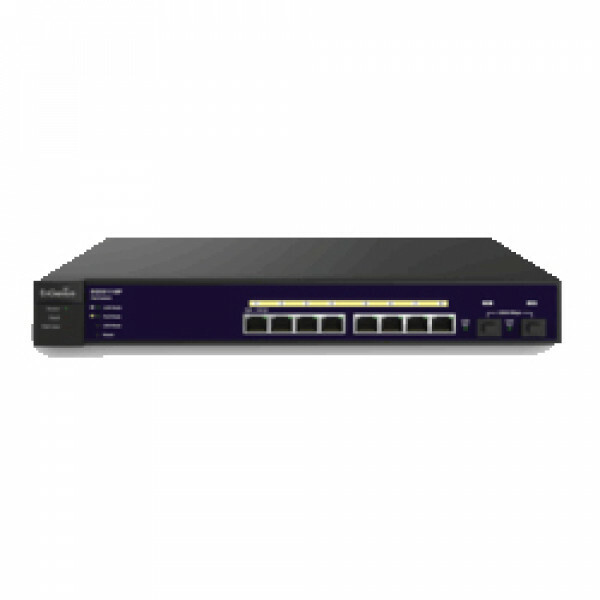 The switch supports up to 30 watts per port over connected Ethernet cables to powered devices for a total PoE budget of 130 watts. It also supports VLAN, QoS and IGMP Snooping features for priority based application, such as IP surveillance or video/voice transitions. It also offers PoE Management on all its Gigabit ports and priority-base configuration. EnGenius Smart PoE (Power-over-Ethernet) Gigabit Switches are specifically designed to meet the needs of start-up and small-to-medium sized businesses. For companies that need a way to connect and power VoIP phone systems, IP Cameras and Wireless Access Points throughout their facilities, these robust and fully-managed, yet cost-effective switches will help to keep their employees connected, safe and productive. EnGenius switches also include embedded QoS intelligence to prioritize delay-sensitive services such as voice and video, simplify unified communications deployments, and help ensure consistent network performance for all services. For example, automated voice VLAN capabilities let you plug any IP phone into your IP telephony network and receive an immediate dial tone.